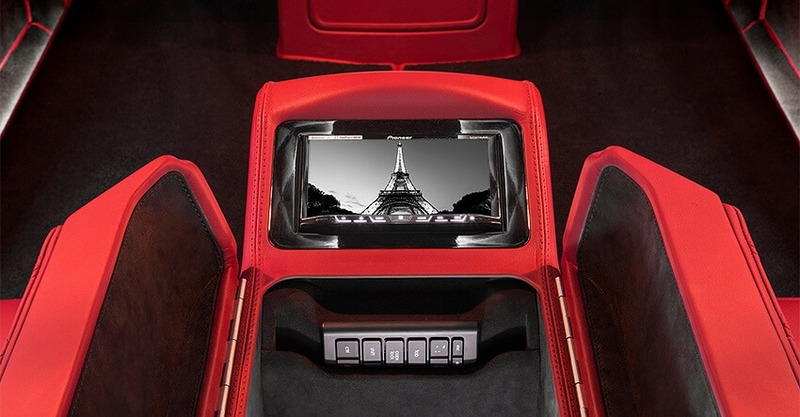 Carisma Auto Design hand-crafts some of the world’s finest luxury conversion vehicles. Their vehicle range includes Mercedes-Benz Sprinter, Mercedes-Benz Viano, Cadillac Escalade, Maybach, and more. With Armormax, Carisma Auto Design provides clients with an option to armour their vehicle with a discreet vehicle exterior and a custom built interior. All their conversion vehicles are custom built to order with a range of design features, luxury options, and optional vehicle armour. The requirements of all our customers – and the subsequent application for conversions are always varied. In countries where there is political and social unrest, additional vehicle security can be important to politicians and business leaders – providing piece of mind to occupants when travelling. Our primary conversion, the Mercedes Benz Viano, can be armoured with a range of protection levels – from hand gun (B4) to armour piercing (B6). This includes vehicle armouring made of steel and ultra-lightweight ballistic armouring material; Armormax (see website here). The design of the armoured Mercedes Benz Viano allows us, in partnership with a specialized armouring company, to armour the vehicle to a customer’s preferred protection level. An armoured vehicle – with a Carisma interior design converted to the same standard as non-armoured vehicles – provides not only luxurious discreet vehicle transportation – but also, even less obvious, exterior protection. From bullet proof windows, re-in forced floors to safeguard against a grenade attack, armoured side panels to protect the occupants from a high powered rifle and “run flat” tyres. There is no obvious exterior indication the vehicle has been armoured by the vehicle’s owner. 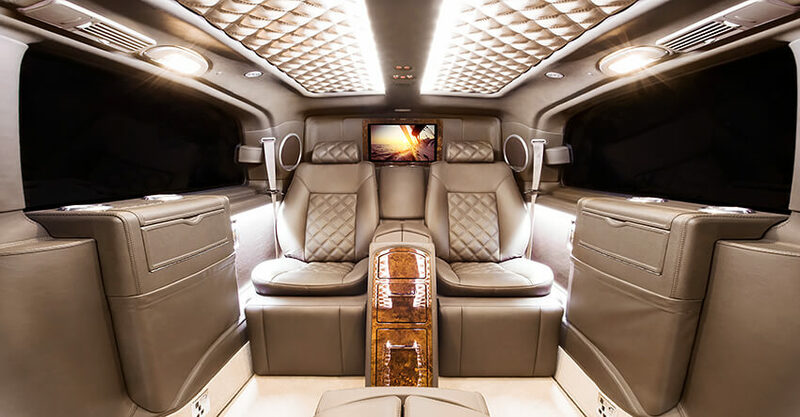 It is possible to armour most vehicles, for example the luxury Escalade, but the generous internal cubic capacity of the Mercedes Benz Viano interior allows us to armour the side panels with particular ease given the space between our custom made Viano side panels and the main chassis. The photos seen on this web page illustrate the armouring build process using the steel option – along with internal control selections – for example activation of the air horn and other features. 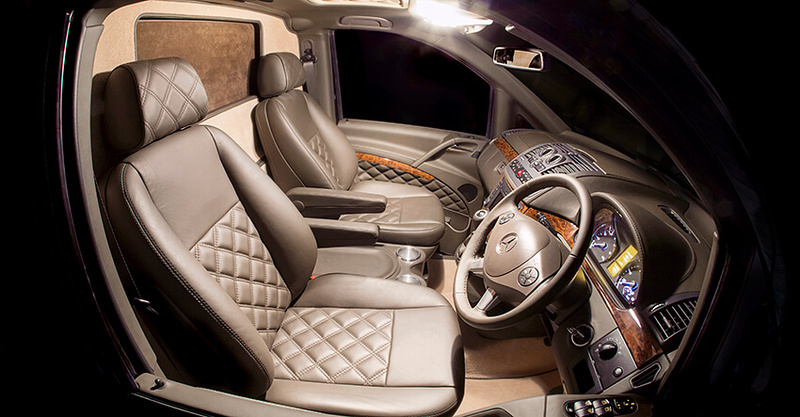 The armoured Mercedes Viano provides our customers with the ultimate interior conversion – with the security to match. An array of configurations are available – Choose from 2, 3, 4, 5 or 6 rear passenger seats for your selected vehicle conversion. Larger vehicles have the option of up to 9 rear passengers. Our luxury double stitched leather seating is electrically adjustable for upper/lower back tilt, lumbar support and headrest, quilt stitched centre panelling and headrest are standard features. Optional extras include: Contrasting piping or stitching, multi-temperature seat heating, cooling and massage systems. Motorised lower leg supports and extended lower leg supports. 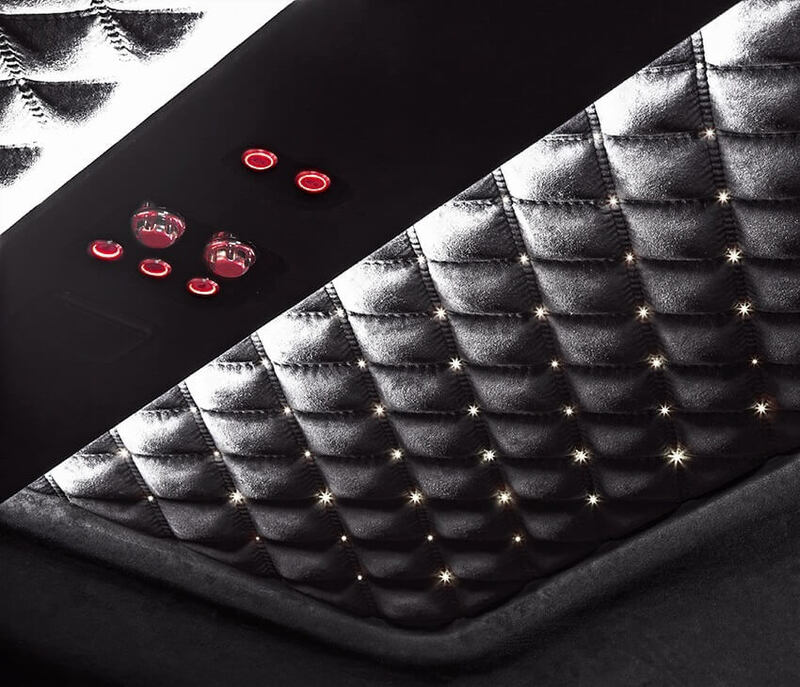 The finest Premium European leathers are used throughout the entire vehicle cabin. Choose from over 400 colours, a variety of grains and textures.Deep lacquered real wood veneers are used throughout our interiors. Choose from classic burr walnuts or from over 50 other exotic wood veneers.A choice of 25 deep pile carpets are available from premium manufactures, including the classic Wilton range, complete with leather bound edge.All switches, cup holders and speaker surrounds are machined with a brushed aluminium finish. Optional extras include: Antique brass or matte black finish to all fixtures. 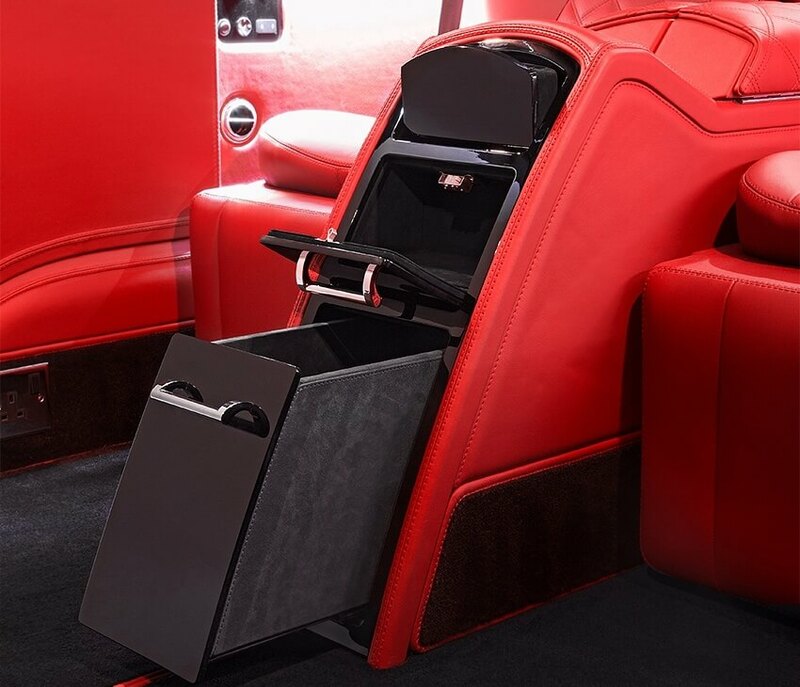 As standard a Carisma vehicle comes complete with motorised privacy partition (excluding 2 seat conversion), a built in refrigerator, upper and lower dimmable mood lighting, illuminated entry/exit steps, stowable side tables, 240V power points and an array of storage compartments. Optional extras include: Illuminated vanity mirrors, Monte Blanc Pen Set + inkwell bottle, Cosmetics Drawer, Burberry™ umbrella (full sixed) in rack, illuminate crystal glass ash trays, Nespresso Machine, cigar humidor and hip flask (in matching leather). We ultimately aim to accommodate any feature of your choice, providing it fits safely into the vehicle. As standard all conversions are fitted with a high fidelity audio system comprising of an amplified eight speaker system. Optional extras include: amplified sub-woofer, dual amplified ten speaker system or upgrade to Bang & Olufsen speaker system. Dependent on seating configurations conversions are fitted with either 40” HD LED Smart TV or two 19” HD LED Screens (front and rear) – a smaller 7” AV control screen is located in rear centre console of most conversions. Optional extras include: iPad control screen. Standard features include CD, DVD, Radio and Bluetooth. Optional extras include: On-board PC / Apple Mac Mini system, wireless mouse and keyboard, In-car WiFi complete with Skype™ and video conferencing. Game Console (Xbox, PlayStation, etc).